A University of Plymouth student has won a prestigious national prize highlighting his commitment to his subject. 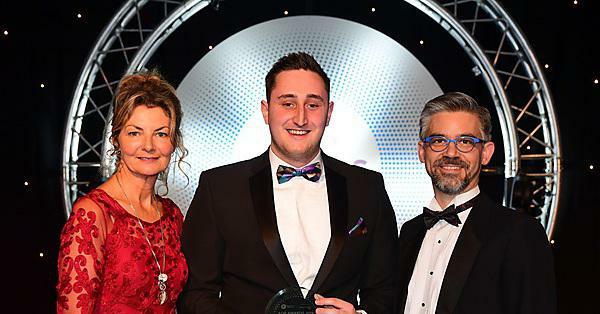 Luke McRoy-Jones, who studies BSc Optometry and is President of the OpSoc society in the University of Plymouth Students Union (UPSU), has been named Student of the Year in the AOP Awards 2019, which is organised by the Association of Optometrists (AOP). The Awards, now in its eighth year, recognises the highest levels of achievement in UK optics. The Student of the Year accolade recognises an optometry student, dispensing optician student or pre-registration optometrist who can demonstrate initiative and drive to improve their fellow students’ participation in, and awareness of, optical issues. “The AOP's Awards is a fantastic initiative with some very worthy candidates and as such, I am proud to be part of that shortlist. Winning this award means a great deal to me as it provides recognition for my extracurricular activities and my passion for the industry, at a national level. "Winning is a real testament to those who have supported me in my journey as a student optometrist, namely the optometry team at university, colleagues and family and friends. I am incredibly passionate about optometry and being part of the exciting direction in which it is taking, and I am delighted to be recognised as an individual who is an 'optical leader of the future'." The winners of the AOP Awards 2019 were announced on 13 January at a national awards ceremony in London. Luke’s award is Plymouth’s second consecutive Student of the Year win, after the prize was scooped by Gareth Towers in 2018. View the full list of winners on the AOP’s Awards pages.